Governments send young men out to fight one another, sometimes good causes sometimes not so. Whatever the cause those that return are changed. 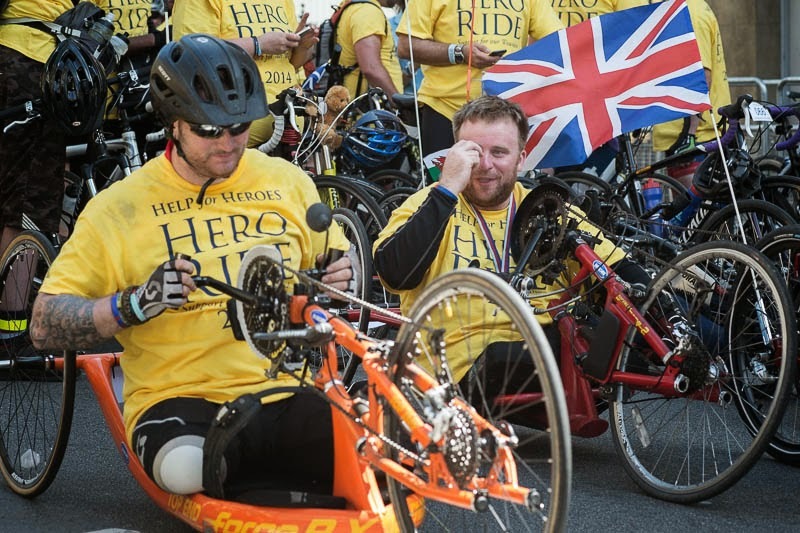 They need support and the rally yesterday for the help for heros was all about that. It is also a time to reflect on the two world wars, 1914 and 1944, milestones for both. John Lennon had the right words.."give peace a chance". That is the worst part of all those wars, where does it lead us to? I am so with you. I just covered the Ride2Recovery here. Will be posting a shot this week. Amen to that! Beautifully said. Our government is big on painting themselves as supporters of the military, but they've turned their backs on a covenant with veterans dating back to the First World War that every government before them followed. They treat veterans' advocates with disdain, cast aside the concerns of those with PTSD, and seem to go out of their way to be contemptful of any concern coming from that side of things. To say that I can't wait for the next election is an understatement. You have a fine, energetic photograph of these veterans.